One of the best examples of an international religious organization not being an extremist is the recent event that took place in the UAE. Sushma Swaraj, a Hindu, a woman foreign affair minister of a secular nation was invited as the guest of honor at the OIC meet. While addressing various global topics on friendship, humanity, and peace, she also addressed the unlawful use of violence. Such practices are being carried out all around the world irrespective of the religions the groups belong to. Terrorism is a topic that gets openly talked about, however, with defensively by speakers. Sushma Swaraj is one of those few exceptions who choose to be bold when it comes fighting with terrorism. 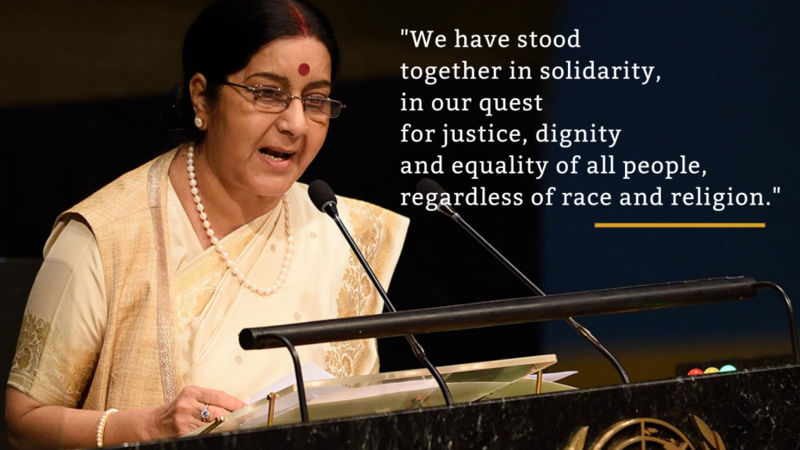 On the occasion of OIC completing Golden Jubilee, UAE celebrating the year of tolerance and Mahatma Gandhi’s 150th birth anniversary, Sushma Swaraj spoke of how terrorism is an issue sheerly distinguishable to religion. Terrorism and extremism hold different names and labels and they are not to be merged. The terrible destruction observed on almost every other day in all parts of the world is devastating. Speaking of the nations being associated with terrorism, Sushma Swaraj said, Every nation in the world undoubtedly demands peace in society. That being said, Sushma Swaraj puts forward a point that can help fight terrorism growing in our country. “If we want to save humanity then we must tell the states who provide shelter and funding to the terrorists to dismantle the infrastructure of the terrorist camps and stop providing funding and shelter to the terror organizations based in that country. At the same time, I would like to say that menace could not be fought, only through military, intelligence or diplomatic means.” Said Sushma Swaraj. She believes that the youth should engage in shaping the future, not in the destruction of lives and humanity. As a contributor to the nations’ growth, we must build a world for the youth where they can be equitable economic growth and social justice. The Foreign Affair Minister then praised the Organisation of Islamic States for making new beginnings and wise choices for better directions that will have a sincere impact on humanity. She hopes that together, we can spread the true meaning and missions of all religions. As we promote, respect each other’s beliefs and faith, we can also advocate moderation over extremism present in societies. Previous Previous post: AI-powered drug design rediscovered by Science!